Here in the Triad, we’ve been wowed two weekends in a row with snow! Amazing. As I tucked in my youngest on Thursday evening, I was trying to keep her from getting her hopes up too much that we would have lots of snow…telling her they were predicting freezing rain, sleet, and more rain. Not much snow. Well, to our delight and amazement, we awoke to 2-3 inches of the stuff. Well, I didn’t exactly awaken to it…I’m an early bird, 5:30 ish is when my internal alarm clock goes off, and there was a dusting of snow on the ground then. I got to watch it come down; heavy, wet snow pouring in around 7 or so. It seems the world is transformed into a value show, contrasts of dark & light, lots of light values, a few midtones here and there. Gotta draw/paint that. A year ago, during a snowfall, I made this drawing from the same view out the window of my studio. I wanted to see if I could indicate, with line only, the values there. It doesn’t matter whether you draw or paint them, the values are really evident in a snowfall…you don’t even have to squint. You can, however, see the connections between the values better if you squint. Isn’t it funny how we “see” better as artists with our eyes half-closed? I wonder if that works the same in Life? The concept behind “squinting” is to simplify the information we have in front of us. With our eyes wide open we simply take in too much detail, the value range is too wide, and we can’t see the “connected whole”. Everything is chopped up into bits, whereas, when we squint, we see how it all works together to make a pleasing whole and unnecessary details get taken out of the picture, quite literally. I’m not sure that we have something as simple as squinting to help us with this in life. But I do know that I get bogged down in the flotsam and jetsam of life, rather than dwelling on the pleasing whole, the forest instead of the trees if you will. Taking a step back and looking for the grander call on my life and the overarching themes in our collective life here, helps me move forward and engage in the flotsam and jetsam that each day brings. There has been a good bit of flotsam and jetsam these days with the kids home from school because of the snow…millions of mittens, hats, wet clothing, boots, toys everywhere, sibling spats, and “will you take me here or there?” Today I’m going to try to “squint” at my kids, rather than seeing them as unending, “Mommy will you…” machines. P.S. As I re-look at the watercolor sketch I made in the wee hours of the morn yesterday, I see some values are just TOO dark…really, I SHOULD HAVE squinted! Lovely w/c (love those flecks of colour), great sketch. And on the theme of squint to see the whole…in a BLINK of an eye those ‘mommy do for me’ years fly by. Thanks for the glimpse. Your drawings and paintings are as always…stunning! Very nice post. What a nice greeting this morning when I opened my laptop, Jennifer. I have forwarded to my yas and we’re going to do some major “squinting” today. Thanks for another beautiful and inspiring post. These are fantastic. And, what a great lesson–focus, that is. Sometimes, I focus such on work-work that I don’t focus my creative side. Hum…..something to work on. So interesting to see the drawing and the painting. Both are really nice! Glad you can still see the beauty and excitement of the snow at this time of year–not sure where you live, but where i am, we are really tired of the gloomy gray days and snow!!! 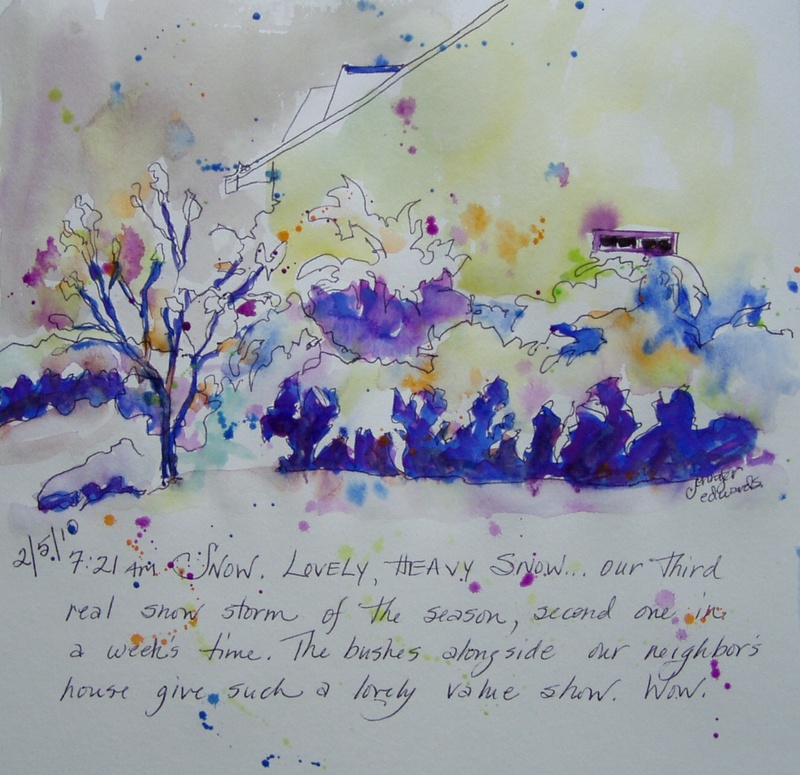 I like Nancy’s word for this painting, Lively! And your writing is always so philosophical! Beautiful colors!!! Your blog has a wonderful surprise at every post, you’ve got an amazing positive energy! Good thoughts and lovely sketches. I like the loose quality of your lines and watercolors. I wonder if you would give me permission to use your line drawing of the snow for a drawing class I teach to 8 high schoolers. I would need a copy of the picture, which you could email to me if you think this is ok. Thanks for considering. I’d like to show them how an artist used line to create value. Thanks.